Patriots ace test against Jaguars 25-6, 25-12, 25-21. Finding the right direction to go can be made clear by the stars in the night sky, road signs along the way, or the GPS talking in a voice of preference. 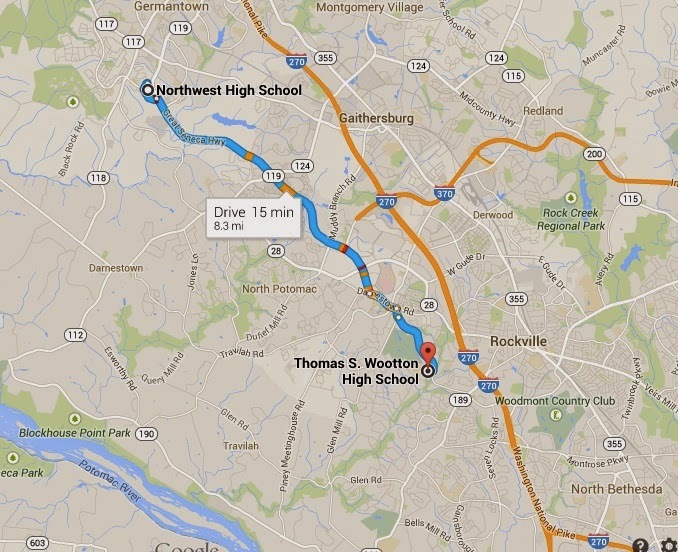 Given the name of Wootton's opponent, Northwest, there was no issue about where to be and which direction to go. It's on the map. Three weeks after forming a team, the Wootton boys are getting to know their own team's strengths and weaknesses and can train to improve in all aspects. But, unknown challenges and opportunities of respected opponents presents murkier roadmap. Wootton formed it's own strategic 'map" to prepare for Northwest. That map included 3 major "routes': 1) Serve aggressively to take Northwest's formidable hitters out of system; 2) Control the ball and eliminate careless errors; 3) Implement a new lineup designed to optimize strengths and match up against Northwest's strong block. The first two strategies worked well for Wootton. The team scored on 16 aces and served Northwest out of system another 38 times while committing on 5 service errors. Holding onto the serve also mitigated the impact of Northwest's strong serving game and sharpened Wootton's focus on controlling the ball to win rallies. The new lineup, however, presented challenges in several rotations. Though fifteen Wootton players saw court time during the three-set match, a few unnecessarily played out of position, though performed admirably. Players finding a way to play good volleyball despite the coach's lineup shortcomings is a step in the right direction. Maybe following these steps will help the Wootton coach figure things out? Wootton continues it's 2014 journey when it returns home to face Whitman on Monday, March 31 at 5:15.